Last week I took a closer look at Formaldehyde, an organic compound and known carcinogen (causes cancer) that is often lurking in our personal care products and homes. I shared exactly what to look for on your product labels to ensure you avoid formaldehyde as much as possible. 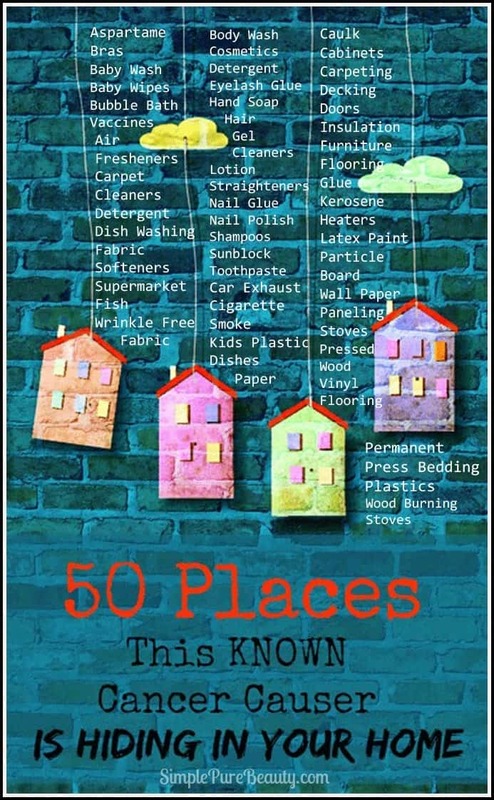 But I really wanted to dig a little deeper and provide a list the many places formaldehyde can hide in our homes and personal care products. I hope this list is helpful to you and brings awareness to the MANY places formaldehyde is lurking. I will try to include alternative options when applicable. Please feel free to share and re-post this list to raise awareness and help others eliminate this cancer causer from their homes. Whew, that is a long list. To read more about decreasing your formaldehyde exposure, click here. What products surprised you the most on this list? Leave a comment below! « What is Formaldehyde & Where is It Hiding? Thank you for this post! I shared it on!